Peppermint essential oil is pale yellow in color with a thin, watery, consistency. It has a strong, fresh, minty aroma. It's found in natural cosmetics and beauty products including: soaps, lotions, lip balms, scrubs, shampoos, creams and more. It benefits the skin, hair and scalp! Peppermint oil is extracted, by steam distillation, from the leaves of the Mentha pipertita herb. 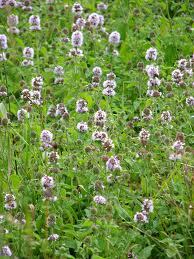 This hybrid herb is a cross between water mint and spearmint. It's found throughout the world, typically, in moist and shady locations. Peppermint is an old world medical herb. Peppermint has antimicrobial and toning properties. It has a cooling, soothing, invigorating sensation. It stimulates circulation, rejuvenating and freshening. Those with acne, oily, dry, flaky or itchy skin all benefit from peppermint. CAUTION! Peppermint has high amounts of menthol. It can irritate sensitive skin. RELIEVES: Itchiness, redness, inflammation, dermatitis, acne, ringworm, psoriasis, scabies, sunburns and other skin conditions. Peppermint essential oil is used for making homemade soap. It's aroma is wonderful! It blends well with: basil, benzoin, bergamot, black pepper, cypress, eucalyptus, geranium, juniper, lavender, marjoram, pine, rosemary, spearmint, thyme or tea tree. It blends, especially, well with citrus oils like grapefruit, lemon, lime or orange. Peppermint has a strong scent. It's aroma is evident in homemade soap. Do not add too much peppermint essential oil to your homemade soap recipes. Too much oil can irritate skin with an overpowering scent. CAUTION! Essential oils contain bioactive ingredients. They're natural, potent, chemicals can interact with biological systems. Never use large amounts externally or internally. Never use straight. Always dilute them in carrier oil, soap, lotion or other buffering agent. Never use without knowing what their bioactive compounds are known to do. Cut 2 lbs. glycerin soap into 1 inch squares. Melt soap in double boiler over low heat, stirring constantly. Do not allow soap to simmer or boil. Do not scorch soap or burn pot. Turn off heat and remove pot. Stir in 1 tbsp. dried peppermint leaves, 1/2 tsp. peppermint essential oil and few drops of red liquid soap coloring. Continue stirring constantly. Pour mixture into prepared soap molds. Allow soap to set, thoroughly. When ready, carefully, remove from soap molds. Use a soap cutter to cut soap into desired size bars. You may want to bevel the edges of your soap for an easier grip. A simple potato peeler works wonders for this! Save soap shavings to re-batch more peppermint soaps! A goat milk soap with coffee grounds and peppermint oil soothes dry itchy skin! This homemade soap is great for those who work outside, frequently. Find the specialty or soap making oil, just right for you! HOMEMADE FACE MASK: Dissolve 2 tbsp. sea salt with 1 tbsp. warm water. Stir in 3 drops peppermint essential oil, 2 drops of tea tree oil and 3 tbsp. of honey until you achieve a yellow, creamy, texture. Stir in 1/4 tsp. cornstarch to thicken the mixture. Place in refrigerator until use. A plastic container, for storage, is fine. Apply mixture to clean face, evenly. Avoid eyes, ears, nose, cuts, scrapes or any other sensitive areas. Leave on approx. 15 minutes. Rinse face thoroughly. Gently pat dry. Discover a clean and fresh sensation. You may feel a slight burning or tingling sensation if you have acne, blackheads or oily skin. This means the homemade face mask is working, drawing out impurities. Those with sensitive skin may experience a powerful drying sensation. If so, afterwards, apply a light natural skin cream to keep skin hydrated. HOMEMADE BODY SCRUB: Mix together 2 cups of sea salt and 2 cups of virgin olive oil. Mixture will be slushy. Add drops of peppermint essential oil. Stir mixture thoroughly. Store peppermint scrub in a glass jar with a lid or airtight plastic container. Gently apply scrub to wet skin, in shower or bath. Rinse thoroughly. Gently pat dry. CAUTION! Avoid cuts, scrapes or broken skin. Avoid face, eyes, ears, nose or any other sensitive areas. Do not use if you have sensitive skin. FOOT MASSAGE: Add Dead Sea salt, Tea Tree oil and drops of Peppermint essential oil to a bubbling foot spa. Cleanse, exfoliate, soothe and refresh! Peppermint oil is beneficial for hair and scalp conditions. It's an astringent that normalizes the scalp's production of oil. It balances the pH level of the scalp putting a stop to oily hair. It neutralizes dry scalp conditions. Get rid of dandruff! It moisturizes hair, stimulating hair follicles to promote hair growth. Always dilute peppermint oil, or any essential oil before use. Some use approx. 3 drops of peppermint oil to 1 full cup of water. Never apply essential oil directly to the skin, hair or scalp. Read the cautions mentioned above about using essential oils.